See and Buy Bahtinov Focusing Masks at our Hertfordshire UK based showroom or buy online. Whether you’re doing planetary visual observing, planetary imaging, or deep sky imaging, the Bahtinov Mask is a great accessory to get the best focus for your telescope quickly and easily. 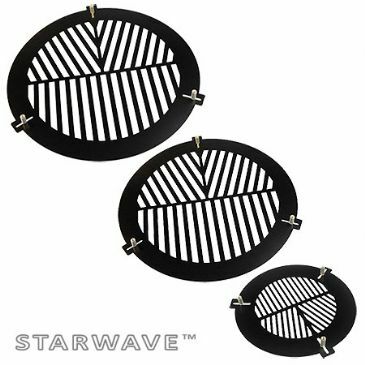 When in place, the Starwave Bahtinov mask works by forming a diffraction pattern of “spikes” of light around a star or point light source, which is easily visible in your eyepiece or DSLR/CCD camera in live view mode. When the pattern becomes perfectly symmetrical, the telescope is perfectly in focus. Focusing is quick, easy and it saves you time “hunting” back and forth to find the optimum focus, whilst trying to judge the size of a tiny point source of light. A Bahtinov mask useful for a quick focusing re-check if the temperature changes during your imaging session. The image below shows how star images appear during focusing. (Click to enlarge). The difference in focuser position is only a few tenths of a millimetre, however the diffraction lines shift considerably. This sensitivity means less time hunting for best focus. There's no more need to guess when you are focused during times of poor to moderate seeing. Simply put the mask, and the status of your focus will become immediately obvious.